Osorio’s shoe sells for $785; Trump’s shoe is only $65. The shoes are obviously very similar — we’re amazed that Trump made Osorio’s already hideous sandal somehow worse. Still, Osorio’s shoe is what gave his label fame when it debuted in 2015. In the original cease-and-desist letter, Osorio gave Trump’s company a week to comply, but they didn’t. Osorio then filed suit in June 2016 on charges of infringement, unfair competition and deceptive trade practices. Ivanka Trump’s clothing brand has been under fire a lot since her dad became President. First, Nordstrom dropped the brand. Its clothes started showing up in bargain bins across the country — sometimes even with her name removed. She’s been sued by a different company over her brand having an “unfair advantage” due to her famous father. And inspectors discovered a huge number of violations at the Chinese factory where her clothes are made. Her brand has also been accused of shoe infringement before. In 2011, New York label Derek Lam sent her company a cease-and-desist letter over a sandal style. Trump’s brand denied that they had stolen the design, but still complied with the order. In 2012, the California label Mystique sued Trump’s company. Like before — and now — a sandal was the offending shoe. Though she again rejected Mystique’s claims, the two companies reached a settlement. 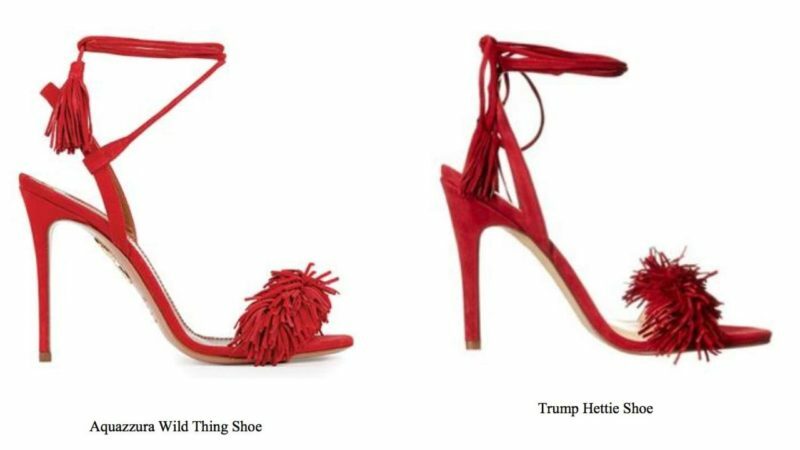 Trump was not aware of the Aquazzura style “Wild Thing” shoe at the time she signed off on the season line that contained the Ivanka Trump style “Hettie” shoe. The burden of a deposition of Ms. Trump would far outweigh any likely benefit to Aquazzura. However, U.S. District Court Judge Katherine Forrest rejected this request. She ruled “[Trump] is alleged to have personal involvement in the events at issue in this lawsuit. She cannot avoid a deposition in this matter.” The trial has been set for March 2018.